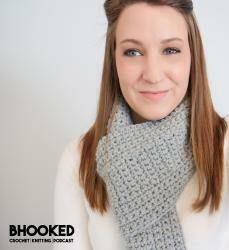 Crochet Pattern by B. Hooked Crochet, Copyright 2014. 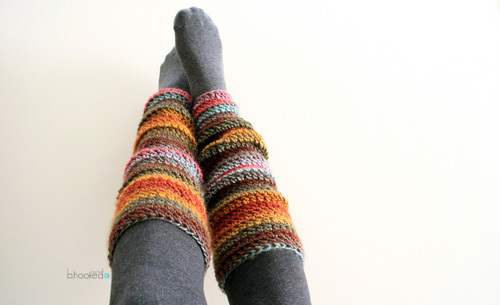 Your leg warmers should measure approximately 14″ in circumference and 11″ long. This pattern fits comfortably around a calf that measures 14″ in circumference at the widest point. You may use more or less chains than the pattern calls for depending on the size of your calf or the calf of the person you are crocheting for. 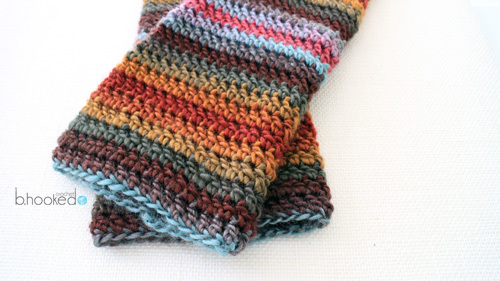 This pattern and video tutorial is completely beginner friendly! Note: if you need to use more than 35 chains, you will likely need to purchase a 3rd skein of yarn. This tutorial is also available in a left-handed version. Click here to be directed to the left-handed video tutorial on YouTube. Join with a slst to the first chain. Make sure your chain is not twisted. Round 1: Ch. 3. Dc into each chain. Join with a slst to the 3rd chain. Rounds 2-28: Ch. 3. Dc into each stitch. Join with a slst to the 3rd chain. Bind off and weave in your ends. I love the feel of this yarn, and love the color schemes it’s available in but I HATE working with it! I don’t feel it’s a very beginner friendly yarn at all! If you make a mistake, it’s impossible to pull it apart to start over. I’ve had to cut so much of this yarn off and throw it away it’s ridiculous! Especially for the cost of the yarn. The pattern is very easy to follow and very beginner friendly. Just wish there was a better yarn to work with that would give similar results. I definitely know what you mean. Roving yarn can be a real challenge! You can substitute with any worsted weight yarn, but like you mentioned the results will look different. My best advice in working with roving yarn is to crochet loosely and make sure you aren’t splitting the fibers as you work. It will unravel easier that way. Best of luck! No need to turn 🙂 Just chain up your three stitches and continue in the same direction with your double crochets. Awesomely simple legging pattern! Thank you! You need to fix how your patterns print out….love your patterns but can’t keep using 7 to 14 pages on simple patterns to print them out! Also the picture of your item we are working on has comments printed all over it. Thank you so much for leaving me these wonderful words of encouragement. I’m so glad that I am able to teach your daughters how to crochet! What color of the Lion Brand Landscapes was used in the pictures above? It looks like the color used in the video is not the same as the one in the pictures. I like the brighter color combination (blue, pink, and rusts) of the yarn in the pictures and would like to reproduce. Thanks! Thank you for this pattern. I was looking for a quick, yet nice looking pattern. These will be my next project! You have an amazing site and YouTube channel. I really appreciate you sharing your expertise. 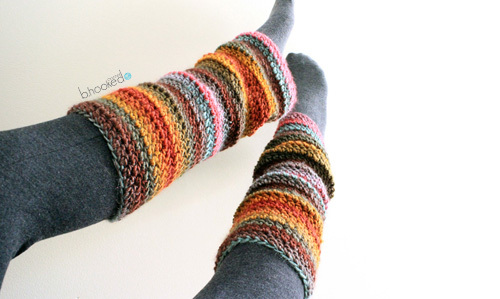 Unfortunately, my local store (and online) are out of the colors you used for your legwarmers, but I’ll choose and alternative. Thank you very much Keely, I really appreciate it! You should be able to highlight the pattern text with your cursor, copy and paste into a word processor such as Microsoft Word. You can then print from there. I totally agree!!! Other simple patterns like this only are 3 pages – this was 7 pages and there is printed messages over the pictures of the item! Thanks I have a friend with really cold ankles and legs that needs this for sleeping at night! She will be very happy for anything to help keep her warmer. It’s medical and she has to live with it might as well help out when I can! I taught myself to crochet this year and I’ve never made leg warmers before. I’m so excited to try your pattern. That’s great! I think you’ll find it very easy and fun! So cute!! thank you, going to make some of these for daughter, daughter in law and grand daughters! i bet they will love them as much as i do, and as much as i will enjoy making them!! God bless, have a wonderful day!